Dubai, UAE – April 30, 2014: Carluccio’s, the authentic Italian caffe, restaurant and foodshop announces the launch of its new Breakfast Menu. The menu has been developed to cater to trends focusing on better quality ingredients and healthy options. The new breakfast menu includes a variety of frittatas, crepes, omelettes and freshly baked breads. Free range eggs are a new addition to the menu, something Carluccio’s feel passionate about, providing increased nutritional value, an exceptional taste and a consideration towards animal welfare. Some of the signature items prepared with free range eggs includes Eggs Benedict, Eggs Royale, Eggs Florentine & Sausage Frittata. All the egg items on the menu and be prepared with ‘free range eggs’ on request. The breakfast menu is accompanied by a range of signature deli food products including croissants, pastries and muffins. The extensive food offering can be paired with a variety of expertly prepared coffees, teas, freshly squeezed juices and cold beverages. Served all day long, the breakfast range is available at all Carluccio’s restaurants in the UAE. Carluccio’s is the acclaimed Italian caf�, restaurant and food shop renowned for bringing authentic and traditional Italian cooking and ingredients to families in a relaxing and friendly environment. 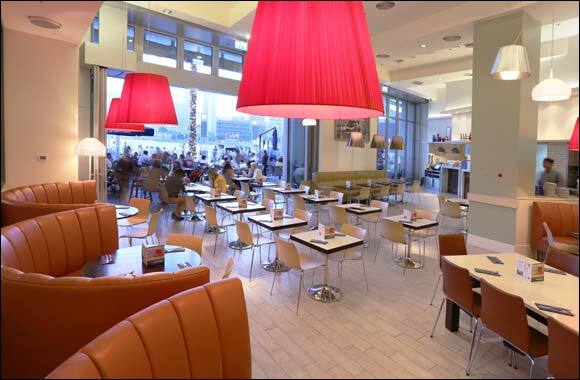 Carluccio’s open kitchens are operated by Italian Chefs who make all the food inhouse including pastas and breads. It is well-known for its pastas, wood fired pizzas, classic Italian desserts, fresh salads, and Antipasti to name a few. Founded by Antonio, this authentic Italian casual dining caf� is present in two locations in Abu Dhabi at The Galleria and the Eastern Mangroves and five locations in Dubai viz., Boardwalk - Dubai Mall, Mirdif City Centre, Dubai Marina Mall Dubai Airport terminal 3 and Deira City Centre. Carluccio’s also made its first venture further afield in the GCC in late 2010, opening an outlet in Doha, Qatar. Carluccio’s deli is unrivalled - offering a scrumptious selection of fresh meats, cheese, salads, olives, tarts and baked food items, in addition to a range of take-away dishes. The foodshop offers a range of specially imported products from Italy to give the authentic taste of Italy to this region. Foodmark is the food and beverage division of the iconic Landmark Group, one of the largest and most successful retailers in the MENA region with market leading positions and brands in apparel, furnishings, electronic and leisure. Established in 2007, Foodmark operates a number of internationally franchised restaurants within the UAE, Kuwait and Qatar including Carluccio’s, Mango Tree, Zafran, Ushna, Max’s Restaurant, Max burger, Jamba Juice and Pie Face. Foodmark has joint ventures with The Meat Company, La Gaufrette and Bazerkan thereby having a total number of 42 outlets in the region. The group’s passion for genuine hospitality and creativity resulted into a continuous expansion of its exceptional concepts that offers fantastic cuisines in contemporary and innovative settings suits each diner’s distinct taste.